OCHS has only all natural herbs and botanical supplements in this hair loss product. The years of research done shows that the most important factor in Hair Loss is a lack of proper nutrition, including all of the vitamins and minerals found in the ingredients. 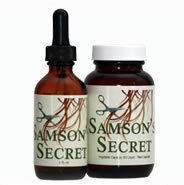 Read the mythical story of Samson and the magical powers hair gave the mighty warrior Samson. For the latest information, be sure to check our news page, and also spend some time learning about the biology of hair growth.